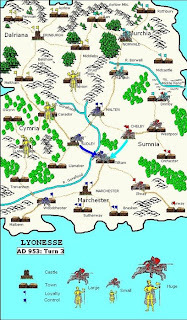 This site was created late in 2008, just a few years after first becoming involved in wargaming. As you can tell by the name, WAB was my introduction to this community. I appreciate the following and comments this blog receives, and give all thanks and credit to my Lord and Saviour, Jesus Christ. It may seem odd that this blog appears to focus on the folly of mankind's continuous warfare, but I believe I can still enjoy this hobby so long as I put Him first in all I do. Maranatha! Choson Korean - for Imjin War. Campanian army with Pyrrhic allies. Seleucid led by Antiochus the Great. Late-HYW French - led by Joan of Arc. 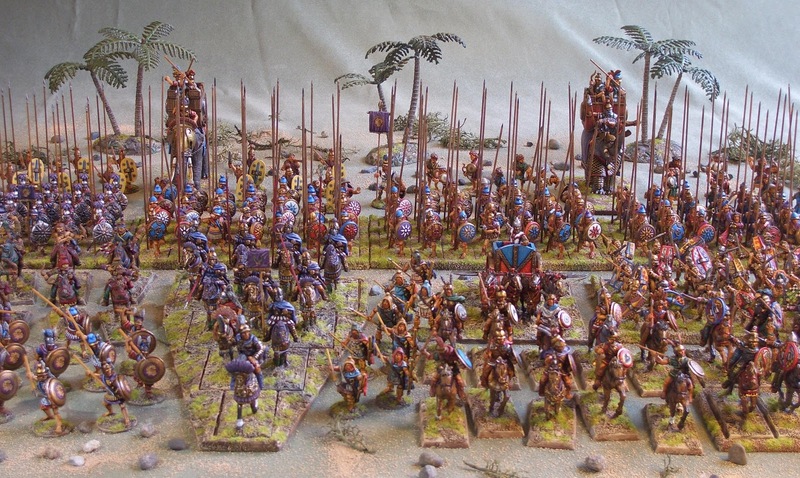 Mycenaean - My first WAB army. Next time this army is used, it will employ more archers - not just the guys in the spear formation. Norman. A small detachment of shortbow archers has been added, and should help missle fire on the move. Early Samurai. This army is suitable for individual skirmish type of games - maybe something out of Siege and Conquest. Macedonian/Successor. This is a core army that can swap out/add various options - anything from Imperial Macedonian to late-Successors. Early-Holy Roman Empire Clerical army led by the Archbishop of Cologne. Here's a quick battle report w/captioned photos from a game which is part of a larger, running scenario hosted & GM'd by Wes R. Today's game (12/6/08) was fought between the forces of Marchester & Murchia - fictional entities among several others in their third year of hard campaigning. 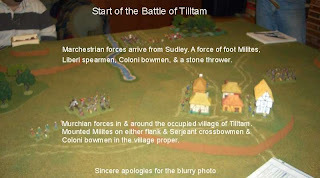 My Murchians had captured Tilltam from the Marchestrians in the previous campaign year. 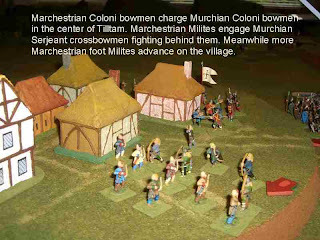 The Marchester forces decided to retake the village. The first relief force arrived from Sudley & a second force arrived from Marchester itself at turn 4. All the figures & scenery from today's game are from Wes' extensive collection. 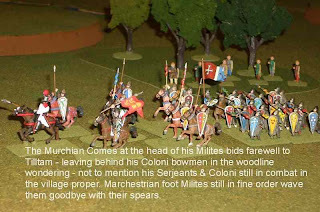 The game ended when Adrian's Marchestrian foot Milites defeated the Murchian Comes & his mounted Milites in combat - who fled off the table. As it is said, "He who fights & runs away, lives to fight another day!" These pictures, in no particular order, are from a series of games played at Adrian's "Edgewood Bunker" using the Shieldwall supplement. All the images can be enlarged for better viewing by clicking on them. 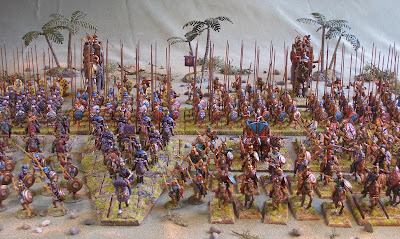 These pictures are from the first game we used the Hannibal & the Punic Wars supplement. As the text alludes to, we didn't have all the rules properly down - particularly the use of elephants. These pictures are from two WAB games played at "Drumbeat" - a historical gamers convention in Seattle, WA, January 2008 . Mycenaeans v. New Kingdom Egyptians (NKE) using the Chariot Wars supplement. The cool-looking Egyptian terrain belongs to Bruce. The Samurai game used the basic rules as the specific WAB supplement, "Divine Wind," is yet to be released. That marvelous Japanese castle/fortress belongs to Bruce D. The big Buddha is Adrian's. Well, this is my very first attempt at starting/creating a blog. Heard a lot about bloggin' but never bothered to "try it out." So here goes. The topic of this blog is of particular interest to me; one of my few remaining "vices" now that I'm a bit older & slower in age. Warhammer Ancient Battles (WAB) combines my long-time passion for military history and painting/collecting military miniatures (okay - what most adults call "toy soldiers"). 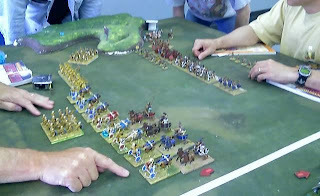 The image above is from my very first wargame (WAB, of course) that was played at the Game Matrix in Tacoma, WA, a couple of years ago. In the foreground is Bruce D.'s New Kingdom Egyptians, and in the background is what was my Mycenaean army at the time - this army has since tripled in size. There were several other gamers who helped me in this new endeavor - Adrian N., Scott A. and Dan P. The notorious Puyallup (War)Gamers. Another reason for this blog is to volunteer as the unofficial "recorder" of the WAB gaming that is being done locally. There are many really good sites worldwide, but I wanted one for the local crew. We'll see how it goes. 1st Infantry Division contingent of the Saxon Kingdom. 1st brigade. The collection I have is to stand as is. More 3mm Swedish for the 1808-1809 Swedish Russian War. Lydia Tischler, Holocaust Survivor: "They didn't succeed in making me a victim." The Grande Armee invades Russia. A Selection of Freshly Painted Otherworld Miniatures.
. This is Gabs´s Life . Thomas O’Brien and Mary Mungava of Parish of Kilmurry-Ibrickane, Mullagh, County Clare, Ireland. Iron Man III Charity army: painted and on ebay! Wooden Wars Campaign- Fundenburg taken! Why Steven Does Life Exists. For God, England & King Edward. Zombies en Comics & Mazmorras!!! Il n'y a plus de surhommes !! Worst Customer Experience of my Life. Born & raised in Honolulu, HI. Retired from the US Army. Now working for WA State Dept. of Veterans Affairs. Married to a saint, with two fine sons and a good dog with us here, and many more waiting on the other side for us.